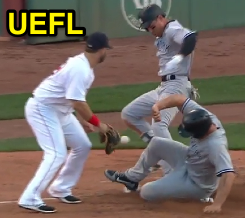 Boston filed a protest alleging interference by Yankees baserunner Matt Holliday as umpires determined no rule infraction occurred during a peculiar sequence Saturday afternoon at Fenway Park. Is Holliday guilty of interference in Boston? The Play: With none out and one on (R1) in the top of the 11th inning of the Yankees-Red Sox game, Yankees batter Jacoby Ellsbury hit a 2-2 sinker from Red Sox pitcher Robby Scott on the ground to first baseman Mitch Moreland, who threw to shortstop Xander Bogaerts at second base to retire baserunner R1 Holliday before the return throw to first base wound up striking Ellsbury, resulting in a fielder's choice force out call (no interference). Replays indicate that as Moreland fielded the batted ball, baserunner R1 Holliday—perhaps under the mistaken belief that Moreland had tagged first base before throwing to Bogaerts—retreated to first base, beginning his slide into his base of origin as Bogaerts stepped on second base to force him out. Due to Holliday's slide into first base, fielder Moreland was unable to field Bogaerts' return throw, which arrived around the time Ellsbury passed first base, the ball hitting Ellsbury and deflecting up the right field foul line, after which Ellsbury remained on first base. Farrell presents his case to Chief Cederstrom. The Call: 2B Umpire Adrian Johnson ruled R1 Holliday out on the fielder's choice, and 1B Umpire Gabe Morales ruled Ellsbury safe on the uncaught return throw, further ruling that no interference had occurred. 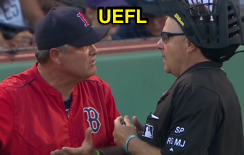 The Argument: Red Sox Manager John Farrell argued with HP Umpire and Crew Chief Gary Cederstrom that Holliday's slide into first base had prevented fielder Moreland from fielding Bogaerts' throw, and, thus, Holliday had committed interference. Farrell argued that this interference should have resulted in a double play. After the four umpires consulted to discuss the play, the interference no-call prevailed, with Cederstrom and Cooper opting to consult with the Replay Operations Center for a rules check regarding interference and its applicability to the aforementioned play. In all, play was denied for approximately nine minutes. (j) If a runner does not engage in a bona fide slide, and initiates (or attempts to make) contact with the fielder for the purpose of breaking up a double play, he should be called for interference under this Rule 6.01...A runner who engages in a 'bona fide slide' shall not be called for interference under this Rule 6.01, even in cases where the runner makes contact with the fielder as a consequence of a permissible slide. Holliday's slide prevents Moreland's catch. Analysis: The analysis will comprise of two parts. First, it will address which precise rule applies to this play (versus which provisions don't apply), and, second, we'll discuss the history of this applicable rule and its application to rule what is and is not interference (yes, we had a recent Case Play on this very rule). To best investigate this play, it will be helpful to go rule-by-rule, point-by-point. Let's begin. > Rule 6.01(a)(4) states that it is interference when a member of the offense stands or gathers at a base "to confuse, hinder or add to the difficulty of the fielders." 6.01(a)(4) does not apply to this play, as it would require R1 Holliday to have stood (or gathered) at first base with the express purpose of confusing, hindering, or adding to the difficulty of the fielders. Without this intent, it is not interference. > OBR 6.01(a)(10) applies to a runner who intentionally interferes with a thrown ball. As Holliday never actually touched the throw (nor did he appear to intentionally interfere), 6.01(a)(10) does not apply. > OBR 6.01(j) is the force play slide interference rule, and states, in part, "A runner who engages in a 'bona fide slide' shall not be called for interference under this Rule 6.01." Holliday's slide met the bona fide slide rule criteria (slid into base, held the base, etc. ), and 6.01(j) cannot apply for that reason. 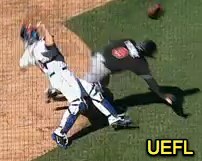 Is it possible to Rule 6.01(j) interference when a runner retreats to a base and commits an illegal slide? Yes, if the runner initiates (or attempts to initiate) contact with a fielder for the purpose of breaking up a double play. About Recently Retired Runner's Interference and Residue of a Legitimate Attempt to Run the Bases: Regarding this brand of interference, the Wendelstedt umpiring manual specifies the precise case of a batter-runner who continues running to first base after being retired (say, on a caught bunt or a third strike that results in an out [e.g., a dropped third strike with first base occupied and less than two out]), and specifies that the retired batter-runner may be guilty of retired runner's interference if he interferes with the play being made back into first base while running outside of the running lane. In other words, per Wendelstedt, the batter-runner is not out if he "hinders or impedes a following play" if he is legitimately running the bases, even though he has already been retired. Holiday makes a legit attempt to run the bases. An even easier "out" here is gleaned from the standard case of a bona fide slide (as illustrated above, and seen during the course of a majority of big league double play attempts). If recently-retired runner's interference applied to any case where a baserunner hindered or impeded the following play being made on another runner, then it would be illegal to slide into second (or third, e.g.) base after being forced out: in other words, if the logic here is that Holliday was out for interfering with the play at first base after being retired at second base, then so too should be all runners who slide into second base after the pivot man receives the ball. Clearly, a runner is allowed to complete a legal base-running maneuver (e.g., a bona fide slide) and he will not be called for recently-retired runner's interference if he is otherwise legal in his running of the bases as he is put out. Crew Chief Cederstrom signals the protest. As for the question of whether Holliday is legally allowed to run (return) to first base: Quite obviously R1 Holliday is forced to advance by virtue of the batter's becoming a runner, but if Holliday legitimately believes the force has been removed, he is permitted to try and return to his base of origin. This is a legal base-running maneuver and only becomes a problem if he actually returns to first base—having not yet been put out—while the batter-runner is standing on first base at the same time. If this wasn't a legal running of the bases, Rule 5.06(b)(2) ("If a runner is forced to advance by reason of the batter becoming a runner and two runners are touching a base to which the following runner is forced, the following runner is entitled to the base and the preceding runner shall be out when tagged or when a fielder possesses the ball and touches the base to which such preceding runner is forced") would not exist, and a runner would be liable to be declared out for abandonment or for some other cause while retreating to an occupied base. The rule is clear: someone must be put out by the defense, not by the umpire. Similarly, see Rule 5.09(b)(6), which states, in part, "If the forced runner, after touching the next base, retreats for any reason towards the base he had last occupied, the force play is reinstated, and he can again be put out if the defense tags the base to which he is forced." Again, if retreating was an illegal base-running action, then Rule 5.09(b)(6) would not exist. Accordingly, Holliday is legally permitted to run to first base and, in accordance with the aforementioned Wendelstedt citation, he is not to be declared out simply for completing his legal base-running action. 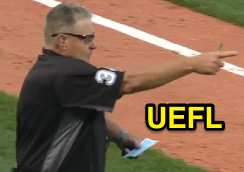 RED HERRING: If you're looking at Rule 6.01(a)(5) Comment ("If the batter or a runner continues to advance after he has been put out...") and believe that retreating to a base precludes any protection from interference, you're getting caught up in semantics that don't affect the interpretation of this play. A similar play occurred in Anaheim in April. The aforementioned Case Play concentrates specifically on the case of recently-retired runner's interference as occurred during an April game in Anaheim. Succinctly, with Angels baserunner R3 Ben Revere caught in a rundown between third and home, trail runner R1 Cliff Pennington rounded second and prepared to advance to third base. 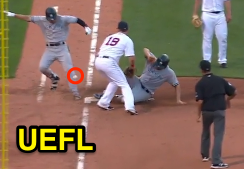 As Oakland pitcher Kendall Graveman ran R3 Revere back to third, retreating runner Revere began a slide, and was tagged out by Graveman before making it to the bag. With Revere out, trail runner R1 Pennington tried advancing to third base, and F1 Graveman tried to jump over the recently-retired Revere in order to make a play on Pennington. As the fielder leapt over Revere, the recently-retired runner completed his unsuccessful "pop-up" slide and, in doing so, essentially upended Graveman as he attempted to complete the double play on Pennington (he was successful). In answering this Case Play, we found that Revere's slide into third base constituted a legal running of the bases, even though he subsequently made contact with Graveman after being tagged out as Graveman attempted a play on following runner Pennington. 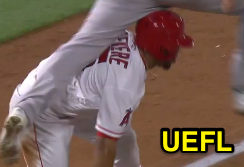 In sum, if the umpires ruled runner Revere's slide—including the pop-up element—as part of a legitimate attempt to run the bases, then he did not interfere with Graveman's play on the following runner. If, however, the umpires ruled that the totality of Revere's slide was not a legitimate attempt at running the bases or that he intended to impede Graveman's play at Pennington, then the proper call would be a double play due to recently-retired runner's interference. Conclusion: As for the play at Fenway Park, since Holliday entered his slide (prior to or concurrent with Bogaerts retiring him) in a legitimate attempt to run the bases—however misguided it might have been—and furthermore did not intentionally hinder the defense, he did not violate retired runner's interference rule 6.01(a)(5) nor any other rule concerning interference. One More Illustration: If you're still lost, it might be helpful to consider the second aspect of Rule 6.01(a)(5), which concerns "any runner who has just scored." Consider the attached image of a just-scored interference play at Citi Field in 2013. During that play, Marlins baserunner Juan Pierre legally ran through home plate, but ultimately collided with Mets catcher John Buck as Buck attempted to make a play on a following runner. HP Umpire Jim Joyce properly ruled Pierre's teammate (Dobbs) out at second base for Pierre's interference for his having run through the base, and, in doing so, completing his base-running responsibility before making contact with the catcher. The question is not whether the recently-retired or just-scored runner actually impeded or hindered the fielder, but whether he did so in an illegal way, for instance, by virtue of an illegal slide, intentional act, or illegitimate action following the achievement of a base.